How long do you take to pull the trigger? I noticed a funny thing today while dry firing. Once I get the gun up and the sights aligned I start to pull the trigger. My goal is to keep the trigger moving until the bang. Today, I noticed that the "wobble" increases and decreases during this time and sometimes the sights are moving little and sometimes they are moving a fair amount. And then it occurred to me, maybe I'm just taking too long to pull the trigger? If I could commit to pulling it faster (but without disturbing the alignment) then maybe I could break the shot before the bigger wobbles start. I tried this for about 10 "shots" and I have to say, about 7 out of 10 looked really good. It took a different mindset and some discipline but it was easier than I thought it would be. This all brought back a memory of an article I read that one of the old champions wrote (maybe Bill Blankenship or Bonnie Harmon). They mentioned that once they had prepped the trigger, they could squeeze the shot off in about 1 second. So I'm wondering, once you have the trigger prepped (slack out, some pressure applied), how long does it take you to break the shot? Re: How long do you take to pull the trigger? I'm supposed to abort if I have held on target for over 4-5 seconds but there are some things I can't really describe that determines if I should abort. If everything isn't how it should be I should abort. I'm making the trigger move for around 3 seconds...I like a long roll, and I want to feel all of it. Some days I make it move faster than that, but if I have a good steady hold I'll make it take 3 seconds or so, I'll make it move longer. I have a 2 second drill in my mp3 player. I use that for dry and live fire practice. If the shot has not broke before the horns goes off I abort. I can't put a time on it but you are correct that the faster the better. Once you are settled into your minimum wobble and are in the black get the shot off. Any delay or hesitation usually ends badly. Like nearly everything with Bullseye shooting, I don't know if there is one, hard and fast rule for everyone. Every person is very different. Some people can hold their breath longer than others. Some people can minimize their wobble while applying pressure on the trigger (these people like roll triggers). Some people's wobble is more from their body than from their arm. It is different for everyone because everyone is different. Generally speaking, you want to pull the trigger as quickly as you can while still being able to get it right. I am VERY slow at pulling the trigger but it is working for me right now. I would guess that sometimes I am into that last bit of pull for anywhere from 2 seconds to as much as 6 seconds - maybe longer. The key is to not force it to happen, the problems that result are just like trying to grab the perfect 10 (or X) - seldom works for anyone. You also don't want to exceed your fatigue point by too much. Benching the gun to catch your breath or to rest your arm/hand is a tough do, but you must learn to recognize that moment in time and react accordingly. I'm with Dan on this one: the faster the better. Forcing an early shot just for the sake of getting it off quickly is counter-productive though. Training your muscle memory to release the shot as soon as the wobble minimizes is the goal of many drills and dry fire sessions. When I use to be able to occasionally get into "the Zone", the gun would go off without any effort on my part as soon as the wobble settled. Always with good results. Most are too fast and too rough on the trigger. Where you point is probably good enough. About 1 second is a good start. Speed comes later. Too slow stalls out and leaves a twitch in the muzzle. Too fast is a jerk. Goldilocks and the 3 bears is looking for just right. Dry fire and you can see it. This is just an observation. One year at Perry, I watched Brian Zins during several strings of slow fire. He consistently took 7 seconds of my counting (not a watch, so probably more like 5-6 seconds) from the time he pulled the gun up to when he broke the shot. Ahh but hold time is a different question. You've probably heard this already, but if you wait for things to be all set up before your start, you're behind the times. Everything you perceive has already passed. The gun should fire as you reach perfect sight alignment in your aiming area. Grunt wrote: My goal is to keep the trigger moving until the bang. Today, I noticed that the "wobble" increases and decreases during this time and sometimes the sights are moving little and sometimes they are moving a fair amount. What you noticed is the natural rhythm of your hold. It will have nulls (relatively motionless) and peaks (wild variations). You should take note of these and know when they typically occur. If you observe closely, you will find that the first null is normally the calmest and each subsequent one loses some of its calm. It is best to have the shot fire during the first or second of these nulls. If you read Don Nygord's Notes, you can find a reference in which he claims that Bullseye shooters typically wait too long. Grunt wrote: And then it occurred to me, maybe I'm just taking too long to pull the trigger? If I could commit to pulling it faster (but without disturbing the alignment) then maybe I could break the shot before the bigger wobbles start. I tried this for about 10 "shots" and I have to say, about 7 out of 10 looked really good. It took a different mindset and some discipline but it was easier than I thought it would be. Isn't it a great feeling when you discover something the best shooters of past times have tried to tell us. Whether we already were exposed or truly found our way on our own, it's great to have the reinforcement of seeing someone else validating our discovery (or, at least, our new understanding). Grunt wrote: This all brought back a memory of an article I read that one of the old champions wrote (maybe Bill Blankenship or Bonnie Harmon). They mentioned that once they had prepped the trigger, they could squeeze the shot off in about 1 second. So I'm wondering, once you have the trigger prepped (slack out, some pressure applied), how long does it take you to break the shot? I believe what you reference is from Bill Blankenship's articles in the Pistol Shooter's Treasury. I think he wrote of taking several months prior to the shooting season to learn how to break the shot as soon as the sights aligned. My personal preference is to start with a safe gun, set up to dry fire, with no ammo around, held in my lap in a safe direction and such that I can dry fire and reset without looking at the gun. Instead I look where it is pointing (for safety) and dry fire with a determined start to finish effort. I do this several times taking note of both the feel and how long it takes to occur. 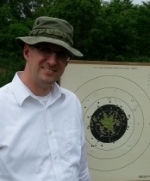 Next, I bring the gun up to a safe blank area and dry fire, trying to duplicate the feel and timing from before. When I can match the operation of the two procedures, switching back and forth as necessary, I add in dry firing against a target. At this point, I try to match the trigger operation across the three scenarios. As someone else pointed out, you can't tell the true trigger part of someone else's shot process, only your own. But, if you are taking ten seconds and you "think" you are increasing through that entire time, you might want to re-evaluate your process via the method I described. When I am firing correctly for me the smoothness of the trigger determines the shot value rather than what I see and the shots typically happen pretty soon after settle, or I start over. I have always wondered this myself, how long different people take for their trigger pull. I have never been very good at slow fire, and have tried both fast, and slow trigger pulls. But have never found any technique that proved to work for very long. I know this won't help much, but when I shoot my best slow fire targets, it's when I am not really thinking about what I am doing, and good shots just sort of happen. It also seems like when I am shooting good slow fires I hold for a while like 7-10 seconds. I'm not really sure if I am slowly applying pressure to the trigger or not. It's more like I hold the gun until it just goes off on it's own. For timed and rapid I do know for sure my trigger pull is pretty quick, I would say less than a second. Here is a drill I worked on during the development of my shot process that helped both my slow and sustained fire. I recorded match commands and put them on my Mp3 player, one of the sets takes me through a string of fire with a horn sound for the fire command and a horn sound for cease fire (no turning target available). The cease fire sounds 2 seconds after the fire command. This has trained me to a.) get the first shot off as quickly as possible b.) not hold for more than 2 seconds. My shot process takes me up to the target turning, dot settled/ing, trigger pressure and bang. Now when shooting slow fire I go through the same commands in my head for each shot and if the shot has not broke in 2 seconds I lower the gun and start over. Almost every one of my first shots are an X, some of the follow ups need some work.